Hello and welcome to my Kumho Ecsta 4X II review. It is always important to know what you want and what you need when buying tires for your vehicle. Tires are divided into several categories and that’s made for a reason. There are normal all-season tires that have a plethora of qualities, but that doesn’t excel in either one, touring tires which are comfortable, durable and quiet, all-terrain tires that work on every surface, winter tires for driving in cold weather and snow, and high-performance tires that give the driver the biggest amount of grip, response, and precision. You get the idea. However, manufacturers tend to sometimes change how a tire behaves so that it can be more attractive to certain buyers. Take the Kumho Ecsta 4X II for example – it is an ultra-high-performance tire made for sports cars, sports coupes and performance sedans, but one with comfort and quietness in mind as well. Not a lot of high-performance tires are made to be comfortable first, but Kumho has always tried to push the boundaries in comfort with their tires. So, who is the Ecsta 4X II for? Well, I would say that it is the best choice for drivers of performance sedans who want a bit more precision and response compared to what a touring tire can give but still don’t want to give up comfort and quietness. But, is that enough to make the Kumho Ecsta 4X II an interesting choice when compared to ultra-high-performance tires from the more expensive premium manufacturer? Let’s find out. 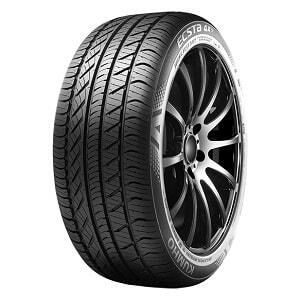 According to Kumho, the Ecsta 4X II is designed to offer a combination of responsive handling, capable cornering and year-round traction (dry, wet and snow), with styling and comfort equal to the finest luxury sedans. They even say that this tire is unrivaled on cold and wet pavement. Up to this point, I am no stranger to bold claims from Kumho – the company simply loves making bold claims, often to no prevail. That’s why take everything you read in this category with a grain of salt. Let’s start – I promise it is going to be fun. The exceptionally stiff tread block of the Ecsta 4X II holds its shape around tight curves and corners, thus providing unmatched handling on dry and wet roads. The asymmetric tread design, which looks cool by the way, expels snow and water quickly and provides the driver with superb handling on cold and wet pavement. The unique rubber compound Kumho uses here is engineered to be flexible at lower temperatures, providing excellent cold traction, while the oversized footprint helps the Ecsta 4X II achieve outstanding traction and maximum road contact. The tread also has noise-canceling properties for smooth and quiet comfort on the road. So, the Kumho Ecsta 4X II is exceptional, unmatched, superb, unique, excellent and outstanding. There you go, it’s the perfect tire. I’m just kidding (duh), but it’s always fun to write about Kumho tires and especially the company’s description of them. Finished having fun? Now let’s move onto more serious stuff. Ultra-high-performance tires are always less durable than their grand-touring counterparts, but with the Ecsta 4X II, Kumho tried to put some touring qualities in this tire. They largely succeeded. While I wasn’t’ able to test this tire for long periods of time, owners around the world are very satisfied with how much this tire lasts – easily a few years of driving. I wouldn’t call that outstanding, but for the price, it is a very good result indeed. Not that this is something new – Kumho are already known for producing tires that have long tread life. So, the Ecsta 4X II borrowed durability from grand-touring tires, but is it any good as an ultra-high-performance tire? It does provide more responsive handling than grand-touring tires, I’ll give it that, and it has high levels of grip in hot weather. But there is no chance it can compare to premium tires in this category when it comes to dry weather traction. If you try it with the likes from Continental, Michelin, Bridgestone and Pirelli side by side, you’ll notice a big difference in the response of the tire, amount of grip, and behavior at the limit. For most owners that will be fine – the Kumho Ecsta 4X II is not bad for performance driving by any means, but if you are a more nuanced driver, this is not the best choice for you. The same can be said for wet grip and traction as well. The Ecsta 4X II is very safe in both light and heavy rain, but comparable products from the premium manufacturers are better. Here, you get what you pay for – Kumho isn’t breaking any new grounds in both dry and wet handling ability. Don’t get me wrong – I like this tire for bringing high-performance traits to a lower price point and larger audience. It’s just interesting how Kumho calls it the best in almost every category and it can still not deliver on that promises. Being an all-season tire, the Ecsta 4X II is capable of light snow and slush, as well as cold weather driving. Here it is comparable to other ultra-high-performance tires – it does provide traction, but only if you drive more slowly and cautiously. For carefree winter driving, go get a proper winter tire. I was honestly surprised at how comfortable and quiet this tire is, especially given the fact that it’s an ultra-high-performance one. While it may not be a substitute for proper grand-touring tire, it holds itself really well when compared to other tires in this category, even premium ones. If comfort and quietness is your main concern and not performance, you may save a few bucks and buy the Kumho Ecsta 4X II. You will get better handling performance than in a grand-touring tire, and your performance sedan (or sports coupe) will look better with the attractive asymmetric tread design. But if you want the highest-performing tire in the corners, one that will give you the most responsive and rewarding driving experience, this is not it. Thanks for reading and I hope you found this Kumho Ecsta 4X II review helpful. If you have any questions or comments please feel free to leave them in the comments section below.